Green Writers Press, 9780998260495, 80pp. 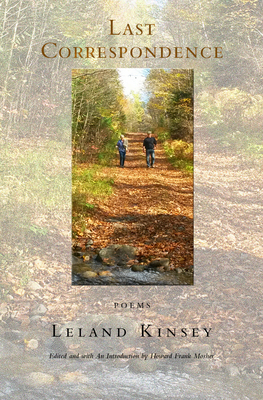 Leland Kinsey, often referred to as the poet laureate of Vermont's Northeast Kingdom, died of cancer on September 14, 2016. He was sixty-six years old. Having recently published a volume of his much-celebrated collected poems (Galvanized, Green Writers Press, 2016), Leland left behind two manuscripts: Last Correspondence, and an untitled sequence of poems, many written or revised during his last illness. This volume is a posthumous compilation of those two collections. Last Correspondence, which was written over a period of four decades, is a rich poetic narrative, in letter format, between friends, lovers, and family members. Ranging from the vast deserts and ranches of the American Southwest, to the mountains and hillside farms of northern Vermont, and on to Labrador's taiga, with side excursions to Machu Picchu and the Isle of Skye, Last Correspondence evokes on every page Emerson's definition of "the kingly bard" who "must smite the chords rudely and hard." Then come the incomparable “Final Poems,” a cascade of stories, characters, and images, mostly from the Northeast Kingdom, and focusing on the recurrent themes of family, work, and place, which have run through Kinsey's poems from the start. Walt Whitman would have loved these poems, so, too, Robert Frost. They represent the finest works of a writer who will always be known as the truest voice of the remote and beautiful "kingdom" of Vermont settled by his Scottish ancestors seven generations ago, and preserved, in perpetuity, in hundreds of the most human and original poems in the history of American letters.